Interested in applying for a position? 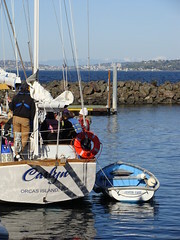 Returning Salish Sea Expeditions Crew? We accept applications year-round and will keep your application on file if you apply outside of our Hiring Seasons (July/August or November/December). We look forward to hearing from you! Salish Sea Expeditions is a nonprofit organization established to provide opportunities for students in grades 5th and beyond to design and conduct real scientific research on the waters of the Salish Sea and within their local watersheds. For over two decades, we have been working with teachers to align our programs with current educational standards and with teacher curriculum. We aim to create a generation of critical thinkers who will collaborate to solve society’s hardest problems. Mission: To inspire youth to connect with the marine environment through boat-based scientific inquiry and hands-on learning, instilling curiosity, confidence, and critical thinking. To achieve our organizational mission, our Education Director and Program Manager hire nautical and marine scientist educators for our Spring and Fall Seasons to teach in the classroom and deliver our program aboard the sailing vessel Carlyn. Programs range from 1- to 5-days, with multi-day onboard programs involving Pre- and Post-Expedition Sessions with our student scientists and sailors. Integral to the success of Salish Sea Expeditions and our hands-on, boat-based programs is a crew full of knowledgeable, curious, enthusiastic, and self-motivated educators. 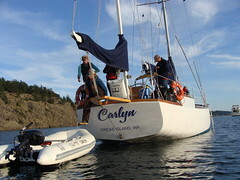 There are typically six crew members on all expeditions. Program Coordinator: Responsible for oversight of the entire experience, facilitates each trip and assists in the science program. Logistics & Galley Coordinator: In charge of preparing lunches for the students and crew and coordinating meals and supplies for the expeditions. Professional development opportunities vary from season to season and may include attending conferences and outreach events throughout the area, volunteer opportunities with other scientific research groups, and continuing education classes in the maritime sector. If you’re interested in joining our team, please take a look at our position descriptions below. Each season we may also host additional programs, including Marine Explorers Weekends, Science Under Sail and Educator Expeditions & Workshops. No Year-Round Positions available at the moment. 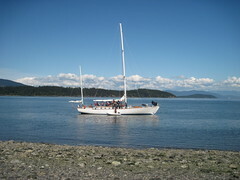 Please check back periodically for new listings, or contact us at info@salish.org to join our mailing list. 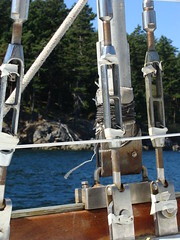 Captain’s duties include, but are not limited to, directing and training sailing staff, science staff, and 5th-12th grade students in safe operation of the vessel and her systems as well as maintaining the vessel in a safe, operational condition of readiness, including directing others in maintenance and repair, and facilitating the education program and community on board. The Captain works directly with the Mate and Deckhand in order to implement nautical curriculum as well as part of a 6 crew onboard the vessel during expeditions. The Captain works directly with the Program Coordinator and other crew members to plan the timing, daily flow, and destinations of the expedition. Compensation: $1900-$2200/month based on experience, full room, partial board and sea time. Complete job description. Application requirements below. Mate duties include, but are not limited to: instructing and overseeing staff students in proper vessel operation, presenting nautical science topics both in the classroom and on the vessel, and teaching a variety of sailing + navigation classes while underway. The Mate directly supports the Captain and works as a team with the Captain and Deckhand in order to ensure a safe environment on the vessel and to address any maintenance of the vessel that is necessary. Compensation: $1500-$1800 per month, depending on experience, full room, partial board and sea time. Deckhand duties include, but are not limited to: instructing and overseeing students in proper vessel operation, presenting nautical science topics both in the classroom and on the vessel, and teaching a variety of sailing + navigation classes while underway. The Deckhand directly supports the Captain and Mate as necessary in regards to the safety needs and management of the vessel. Compensation: $1400-$1600 per month, depending on experience, full room, partial board and sea time. 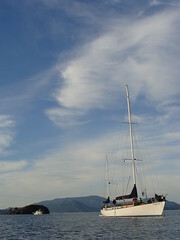 The Program Coordinator is responsible for the overall experience of an expedition. Pre-expedition and office duties may include managing paperwork to prepare for the trips, coordinating with other staff for expedition prep, general maintenance of scientific equipment and program development as necessary. The Program Coordinator will also work with other staff to help students in their classroom to design their marine research project. Primary responsibilities aboard the sailing vessel are to oversee onboard program operations, collaborate with the Captain and other crew members to facilitate meetings to plan the timing, daily flow, and destinations of the expedition, and to assist the Marine Scientist in the implementation of the science program. The Program Coordinator will be one member of a 6-person team. Compensation: $1500-$1600/month, depending on experience, full room, partial board and sea time. The Marine Science Educator is responsible for assisting students in developing their research project in the classroom as well as collecting and analyzing oceanographic data onboard the vessel. Pre-expedition duties may include preparing materials in the office to prepare for the trips, assisting in food and supply packing, logistical projects, general maintenance of scientific equipment and program development as necessary. Primary responsibilities aboard the sailing vessel are to instruct and supervise 5th-12th grade students (up to 14 at a time) who are creating a sampling plan and itinerary, deploying science equipment, analyzing data, and synthesizing results. Compensation: $1400-$1600/month, depending on experience, full room, partial board and sea time. The Logistics & Galley Coordinator will be responsible for coordinating pre-trip and day-to-day food and supply details for 3-5 day science education programs and day sail events aboard the vessel. This position will be split with approximately 30% of time in the office and 70% onboard the vessel. In the office, the Galley & Logistics Coordinator will use student menu plans provided by each group to design meals for the duration of the expedition. Shopping for and packing food and additional supplies necessary for the trips will also be the responsibility of the Galley & Logistics coordinator. Onboard the vessel, the Galley & Logistics Coordinator will be responsible for preparing lunches and snacks for all participants, organizing foods so they can be divided for the group camping onshore as well as the group sleeping on the boat in the evening, ensuring there are adequate food stocks and cleaning supplies aboard, and assisting marine educators and sailing crew where needed. Salish Sea Expeditions does not and shall not discriminate on the basis of race, color, religion (creed), gender, gender expression, age, national origin (ancestry), disability, marital status, sexual orientation, or military status, in any of its activities or operations. These activities include, but are not limited to, hiring and firing of staff, selection of volunteers and vendors, and provision of services. We are committed to providing an inclusive and welcoming environment for all members of our staff, clients, volunteers, subcontractors, vendors, and clients.